Sure, you can say, "I never ride in the rain - that's why I keep a cage!" That's what you'll say - UNTIL - 30 miles from home - - lovely day - - about 80 degrees (F) and bright sunshine. WAIT - what's that cloud doing - oh, for heaven's sake, it's growing - and growing - and RAINING! Like the proverbial cats and dogs! Wow - you'll get soaked, as will your billfold, pocket notebook, and everything else from your chin to your toes. 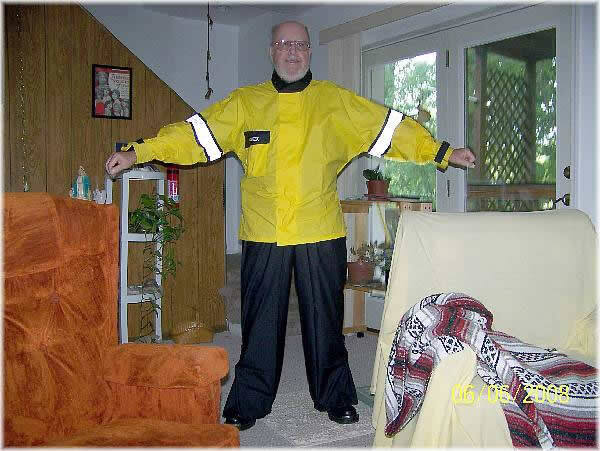 The only way to avoid the issue is to prepare in advance by buying rain gear. After shopping online, I elected to spend a bit more (maybe?) and save on shipping - as well as getting a look at the product BEFORE it arrives in the mail. This 2-piece suit is (sigh) made in China, but the quality seems good and the "Large" size fits over my "Nitro" armored mesh jacket, blue jeans and M/C boots. The suit is a "Pro Sport" (sold by p3racing )who sell dozens of products for "powersports" only through retailers. 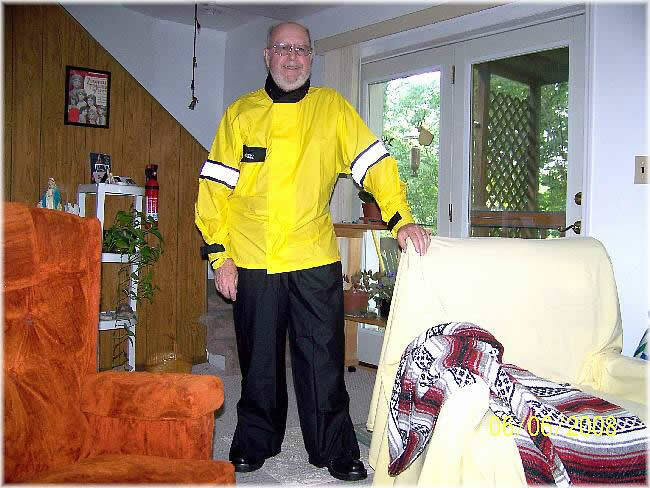 [Or - Google Motorcycle rain suit Pro Sport.] I found this same suit at J.C. Whitney listed (plus, of course, shipping and handling) at the same as I paid here in Chattanooga. You can see that the jacket has a wide double-fly front. It has an inner zipper and outer "Velcro" (Hook&Loop) seal. Each sleeve likewise has H&L cuff adjustments. The legs have side zippers about 18 inches long at the bottom (not closed here), and boot-stirrups to prevent "blowing up." Those pants have a powerful elastizied waistband and are long enough to reach nearly to my armpits; the better to keep out blowing rain, don'cha know? I haven't tested the strength of the seams, because that could destroy the suit, but the "welding" and reinforcement at each junction appears flawless. There's a hood tucked in the (zippered) collar and one front patch pocket with H&L tabs . . I suspect that this pocket will leak in a heavy rain. One of those afternoon thermal thunderstorms caught me in a meeting today. Fortunately I had packed the rain suit in the Helix's rear compartment. Also fortunately, I had a place to sit down inside while putting the pants on over my boots! That is no easy job! But, after all was said and done, the suit fits and functions exactly as hoped-for. I deployed the hood too, put my helmet on over it, zipped everything tight and took off into a "several-inches-per-hour" downpour. Water in the street inches deep (ooops - slooowly around corners!) not far to ride, fortunately. Home, dry if a bit "humid" under all those layers at 90F plus and 100 percent relative humidity. Still - I'm even more convinced that getting into those pants without help is going to take practice before I have to do it alongside some rural highway. ©2006 Bill Laudeman; all rights reserved. Page updated Monday, June 9, 2008 17:02 Eastern time.